Here are a few of the photos I took today during my visit to the AMNH. I decided to be “adventurous” and take exclusively B&W shots, hoping to better convey the mood of some of the fossils (or their replicas) that I was looking at. I’ll leave you to be the judge as to whether any of them succeeded in giving more life to the old bones than I have been able to do with color photography. The relatively gracile (at least compared to the specimen on the 4th floor, see below), yet dynamic mount of Allosaurus in the Grand Rotunda of the AMNH. The skull of the 4th floor Allosaurus, the famous mount being bent over the chewed vertebral column of an Apatosaurus. Skull of the “Bear Dog” Amphicyon, a member of the Carnivora from the 4th floor mammal halls. Notice the big saggital crest, the placement of the cheekbones further out from the head, and lack of bone that (while typically not closed at the back) would normally surround the eye. This creature would have had an incredibly powerful bite. Indeed, the skull of Amphicyon reminded me of that of the creodont Hyaenodon. Again, notice the sagittal crest, the cheekbones placed further out from the skull, and the near lack of bone that would enclose the eye. While smaller than the “Bear Dog,” I still wouldn’t want to cross a Hyaenodon on a bad day. Compare both those skulls with that of the nimravid Hoplophoneus and you’ll see what I mean. Hoplophoneus doesn’t have as prominent a sagittal crest, and although it still seemed to have large jaw muscles, there isn’t the same degree of reduction of bone surrounding the eye as is seen in the previous two mammals. And, if you like, you can compare them further still with this Smilodon that had broken off it’s left canine. Such occurrences were likely painful, debilitating, and possibly even eventually fatal, and it makes me wonder if this one died as a result of it’s wound or if it continued to survive for some time longer (which opens up all sorts of questions). A close-up of a more intact Smilodon. A stuffed Giant Anteater from the Hall of Biodiversity. I much prefer photographing lives xenarthrans, however. Apatosaurus is the first sight to grace visitors entering the Hall of Saurischian Dinosaurs. The robust neck of Apatosaurus looms high above. Casts of the sauropod footprints R.T. Bird found in Paluxy, TX. The head of Barosaurus, held up to (perhaps literally) dizzying heights. One of the forelimbs of Barosaurus, held out threateningly at the Allosaurus in the first photo. The head of a mini-reconstruction of Barosaurus. The juvenile Stegosaurus model was pretty impressive, too. One of the largest self-contained “bioshpheres” I have ever seen. The little dots are shrimp. One of the most wonderfully preserved (and in my opinion, publicly unappreciated) skeletons every found; a complete and articulated Corythosaurus with skin impressions, collected from the Red Deer River region of Canada. A juvenile hadrosaur, probably either Corythosaurus or Lambeosaurus. I ran back and forth looking at skulls to try and figure it out, but the skull of the juvenile is slightly distorted, so (me being without access and a CAT scan at hand) I wasn’t able to confirm or deny my leaning towards my hypothesis of it being a Corythosaurus. A reconstruction of a Deinonychus skull. I looked at the forearms of the skeleton for signs of feather attachments (as had just been announced for Velociraptor by AMNH scientists) but I couldn’t see any, nor could I get close enough to get a good look. Outside, one of it’s distant, extant relatives took a sip from a small puddle. The skull of the synapsid Edaphosaurus. The toothy jaws of Elasmosaurus. The famous Giant Squid that spreads its tentacles above the Hall of Biodiversity. Perspective on a large, iron meteorite. One of my most favorite mounts in the entire museum; Prestosuchus. The most popular dinosaur in the museum, Tyrannosaurus rex. The crushing jaws of Tyrannosaurus. A stuffed Leopard, posed over a peacock. This is another animal I would much rather photograph while living. And last but not least, my little cat Charlotte, silhouetted against the evening light while she watched the birds outside. It’s too early for Friday notes, or is it? Some time ago I confessed my overall ignorance when it came to pterosaurs, so I was definitely happy when a 1966 reprint of H.G. Seeley’s Dragons of the Air arrived yesterday. 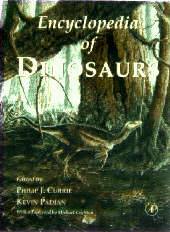 Being written in 1901 it’s bound to be a bit dated, and Seeley seems to focus on the European pterosaurs more than anything else, but it’ll make for an interesting and quick read. I hope to finish G.G. Simpson’s Attending Marvels and Simple Curiosity during the course of the weekend as well, which should be an easy task as I’m more than halfway through both. 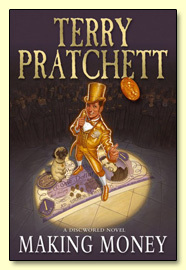 I do make time for fiction every now and again, though, and I was definitely pleased to find that Terry Pratchett’s newest book, Making Money is now out. Being that Going Postal is my most favorite of the Discworld series to date, I am certainly looking forward to reading of the continuing trials and tribulations of Moist von Lipwig. Tomorrow morning I’ll be hopping the train with some Rutgers students to the AMNH to teach them something about Deep Time and paleontology. The Big Bang, stromatolites, fossil horses, and whatever petrified critters they take an interest in will be covered, and I am definitely looking forward to using the 4th floor fossil halls as a sort of classroom. I’ve only got them for about 3 hours, however, so I’ll have ample opportunity to run around on my own for a bit afterwards. 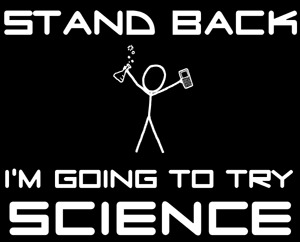 I have to start making up my PPT presentation for next week as well, so this weekend will be a busy one. If the weather is good I want to try to visit Haddonfield on Saturday to see the site where Hadrosaurus foulkii was discovered and see if I can’t find the chocolate marl from which it came, but that might have to wait. Finally, although it only appeared in the news reports for a quick moment, a new paper in Science seems to show evidence of feathers on Velociraptor in the form of quill attachments. Unfortunately I can’t access the journal from home, but I am not glad that I was delayed in writing about another recent feathered dinosaur in the news so I can put them together in one post. Speaking of journals, I finally was able to get someone to sign my membership form for SVP as well, and I am looking forward to receiving the Journal of Vertebrate Paleontology in the mail. My post on “wee little sauropods” is still in the works as well, but I have many more papers to read before I can be sure I’m actually making sense and not just writing fiction myself. The author in front of Charles H. Sternberg’s Edmontosaurus (“Trachodon”) mummy at the AMNH. Sternberg was often hard-pressed for cash, so he packed this specimen up before one of H.F. Osborn’s man-in-the-field could take a look at it. Having purchased quality specimens from Sternberg before and knowing that the specimen could very well go to another museum, Osborn decided to pay Sternberg the sum he asked for, and it proved to be a very wise decision. “Do you want to go and visit your dinosaurs?” “Are you kidding?” comes my incredulous reply, and my wife and I climb the alternating staircases up to the famed fourth floor of the American Museum of Natural History in New York City. I can scarcely remember the details of my first visits to the museum when I stood little higher than Ornitholestes, taking a cab from Penn Station to the museum with my parents, a poster of a horse skeleton next to a human skeleton in the elevator making quite an impression on me (I recognized the human form, but I had no idea what the other one was). The rest of the museum was interesting, surely, but my young brain was only interested in one thing; dinosaurs. Even to this day, no visit is complete without at least a passing visit among the fossils (or, at least, what look like fossils in some cases), and anyone who has taken a trip to the museum with me knows I am loathe to leave without meandering through the 4th floor pathways. My first visits took place during a time when the great fossil halls were divided by time period, the skeletal contents of the halls of Saurischian and Ornithischian dinosaurs jumbled together in the dark, musty halls of Jurassic and Cretaceous dinosaurs. Some non-dinosaurian celebrities appeared through the halls as well, a far wall of the Jurassic hall displaying the ever-impressive Dimetrodon from the Permian of Texas. What I remember most clearly, however, was the imposing form of “Brontosaurus” looming out of the shadows. Long before the renovations of the mid-1990s, the fossil halls were shadowy places, the subdued lighting casting a more “primordial” mood on the hall. I was in awe of that composite skeleton, and even though I knew it was a herbivore, the short head with large blunt teeth made me think twice about whether I would call the dinosaur “harmless” in life. It didn’t matter that the skeleton I was standing beneath did not hold up huge masses of flesh for over 100 million years; I could have sworn that I heard the behemoth breathing in that dark, dusty hall. The trackway that R.T. Bird collected from Glen Rose Texas, positioned just under the feet of the giant, further gave the impression that it had just walked out for its daily viewing, perhaps waddling back into one of the storage rooms where it went to pieces at night. If I had believed in ghosts, I would have sworn that one of the restless spirits had lumbered all the way over from the Howe Quarry assemblage in Wyoming, taking possession of the skeleton but never getting a bite to eat as the paleontologists hadn’t had the presence of mind to bring some “fossil fuel” in the form of petrified leaves and ferns for poor Bronty to eat. An archival image of “Brontosaurus,” posing in the older fossil halls before the first renovation during the era of R.T. Bird and Barnum Brown. This was the skeleton that so awed me as a child, although the setting in which I first saw it was a bit darker. I’m sure that I saw the impressive Tyrannosaurus and Triceratops in the Cretaceous hall, and I faintly remember seeing some of Charles R. Knight’s fantastic murals that I had only seen miniaturized in so many children’s books (you really must see them blown up to their true size, or at least in high resolution; so much of the vibrance is lost in many books that have reprinted the paintings), but it was the Jurassic Hall that made the biggest impression on me. The life-size Blue Whale downstairs filled me with a sense of astonishment as well, and it was hard to believe that anything could possibly have been that big or that such creatures still swam in the oceans. Unfortunately, I did not get to visit the museum again until about 2002, mostly because of a general unease about New York City that my parents possessed and subsequently instilled in me as well. The dinosaurs were still there when I returned, even in greater number than before, but things were not how I remembered them. A crested pterosaur hangs over the distal portion of the Hall of Vertebrate Origins at the AMNH. The fourth floor of the AMNH, containing its fabulous vertebrate fossil collections, was entirely renovated between 1994 and 1996. In addition to “Brontosaurus” getting a name change, a new head, and an extended tail, the halls were reorganized according to cladistics and opened up to the sunlight, great windows throwing plenty of light on the stark white walls. Indeed, rather than organizing the fossils by time period, as had been the tradition previously (a tradition of grouping by convergent structures being an even older European tradition, as in Cuvier’s museum), the curators and designers decided to group the fossils according to their evolutionary relationships, creating something of a path for visitors to walk through. In addition to this, various computer kiosks featuring video explanations of many of the fossils were installed, adding a new level of “interactivity” to the exhibitions. Despite all this reshuffling of old bones mounted on armatures, however, I can’t say that I especially like the newer layout. Anyone who regularly visits this blog knows how much I enjoy my visits to the AMNH, but my familiarity with the institution has also made me a bit critical of it as well. While I do have my gripes about the Hall of Biodiversity exhibit and the sorely out-of-date Hall of North American Mammals (it is now so old that I don’t know whether the laugh or cry when I read the labels of many of the animals presented in the dioramas and reflect at the current state of their populations in the wild), the fossil halls do the most to inspire and irk me simultaneously, and much of what I have to relate deals with the great osteological collections. Note: If you want to follow along, the floor plan is available online. While I can understand the reasoning behind organizing the exhibits in terms of derived characters, the approach quickly goes to pieces and seems to be above the heads of many of the visitors. The first section of the fourth floor, the Hall of Vertebrate Origins, does an acceptable job at branching off along a main path into different groups of vertebrates, acting something like a progression through time as well (at least until the end where turtles, phytosaurus, crocodilians, mosasaurs, pterosaurs, plesiosaurs, etc. are all grouped closely together). 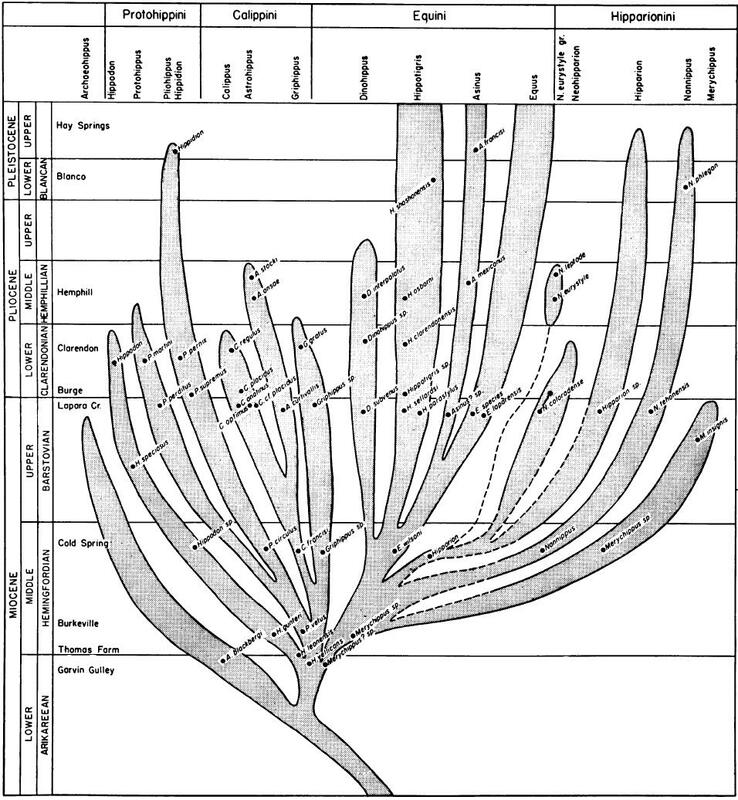 The primary problem I have with this sort of set up (which is the same problem I usually have with cladistic trees) is that everything ends abruptly in a cul-de-sac, giving the viewer no indication of whether the group continued, went extinct, or who the direct ancestors were. Location in terms of both time and place are ignored, and while this may be able to be understood by the more scientifically-informed visitors, I don’t think it presents the best understanding of evolution to those generally unfamiliar with the topic. A head-on view of the reproduction of Deinonychus in the Hall of Saurischian Dinosaurs. Things start to get shakier once we leave the Vertebrate Origins hall. Although I don’t usually follow this route, the path directs the visitor towards the Saurischian Dinosaurs, the theropods Tyrannosaurus and Allosaurus dominating this hall. Apatosaurus is sequestered (even coralled) up against the wall, still frozen in its tracks, but visitors can not get anywhere as close to it as I could in earlier years. This hall leads the visitor to the Ornithischian dinosaurs, Stegosaurus, Triceratops, and Anatotitan giving their imposing presence to the hall. These dinosaurs didn’t seem to get the same refurbishment as the Saurischians; poor Triceratops is still holding its front limbs out at 90 degree angles in a “super sprawl” pose, and the Anatotitan pair still have tails that would have had to be broken in order to make them droop in the manner that they do. The Ornithischian dinosaurs give way to “Primitive Mammals,” although Dimetrodon, Edaphosaurus, Lycaenops, and other Permian forms are the main representatives in the first half of the hall, the second half being a mish-mash of various unrelated genera and xenarthrans like giant ground sloths and glyptodonts. The Milstein Hall of Advanced Mammals follows, starting off with early primates like Notharctos to the right, saber-toothed cats and other unrelated convergent forms to the left, the pathway proceeding through titanotheres, sirenians, and other groups before culminating in the impressive mammoth and mastodon skeletons at the end (be sure to look carefully around the feet of the mammoth; there is quite a surprising specimen of a baby mammoth’s skin in a glass case). “Mr. Bones”, Barnum Brown, posing with his “favorite child” in the old Cretaceous Dinosaur hall at the AMNH. The feel of the exhibits is also different from how I remembered them. Originally there was a more relaxed tone, visitors being allowed to get very close to the specimens, giving you the feeling that you were really under the feet of dinosaurs. I can see how this can be a problem for security/safety/janitorial reasons (lots of garbage and debris often ends up under the mounts), but now visitors are kept at arms length from specimens by glass or other barriers. It no longer feels like the fossils are part of a common heritage, something that everyone has a right to observe and learn from. Instead, it feels like we’re being allowed a look at the fossils, specimens that we have no claim to. 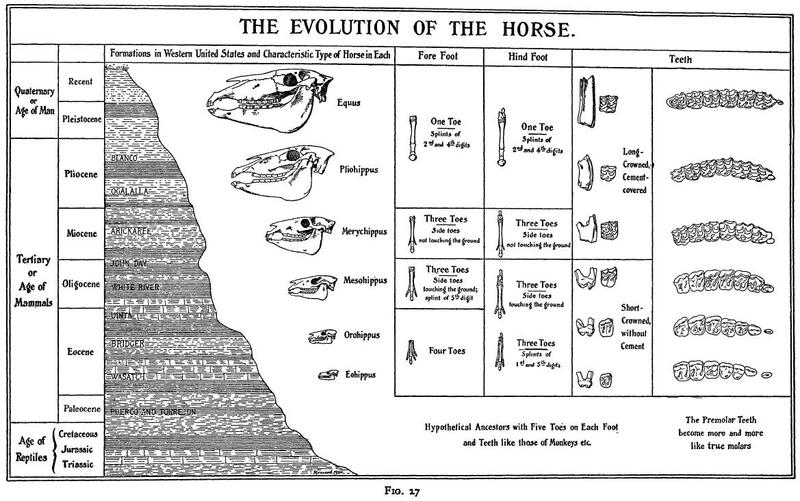 This correlates with a major shift in paleontology that has taken place in the last 50-75 years; fossil studies have increasingly come into the fold of “good” science, and it is doubtful if the bone sharps of old could have contributed what they did to science if they were born today. Where amateur collectors and those who possessed an interest and passion for fossils once built up the fossil halls and the science of paleontology, non-professional workers are often scorned or looked down upon today, and there are often battles between what is publicly owned, what is privately owned, and what should be done with fossils that are not in the hands of museums or universities. Regardless of where you stand on this issue, the AMNH halls reflect a step away from public access, I feel, making the bones some more cold and distant, objects to be studied but not really appreciated. The lighting probably affects this more than anything else from my perspective; the lack of contrast and shadow removes much of the mood, and it is harder to imagine the animals as they would have been in life when harsh light is thrown upon them. I much prefer the set up of the Royal Tyrell Museum near Alberta, Canada, the dinosaurs there taking on a life of their own in the shadows (click here and view the see two virtual tours to see what I mean). So what of the computer kiosks? The fourth floor has a few kiosks here and there with a guide-ball and computer screen, users being able to click on various creatures or nodes on a cladogram to get more information. This is not a bad idea in and of itself, allowing those who are interested to learn something more, but it doesn’t seem to be a big hit. Children often think the screens should allow them to play some sort of computer game, and I have seen far more rapid and irritated clicking than attentiveness whenever a child has used one of the computers. The computers are also relatively slow, taking a good amount of patience, and when they’re working it is sometimes hard to hear what the person on the video screen is saying. I’ve learned a thing or two from the video kiosks, but overall they were not very exciting or interesting, and I don’t think they appeal the younger audiences at all (and if you’re talking about dinosaurs and can’t interest kids, the adults probably won’t be any more intrigued by a discussion of why theropods have so many holes in their skulls). I had mentioned games just a moment ago, and from what I have seen from my last visit to the Philadelphia Zoo, educational games seem to work better to interest visitors to an extent. The game I checked out myself, which seemed to be fairly popular, was one at the Big Cat Falls exhibit, the user playing a Jaguar in the southwest of the United States. The goal was to direct the Jaguar step by step to migrating across an area while eating food but not getting shot by ranchers, each step taking a moment to explain why the big cats are rare in the U.S. Not everyone will stop and play, and it’s not the ultimate answer (I am somewhat ill-at-ease with the concept of children coming to a natural history institution to play video games), but it is still better than many other displays that I’ve seen. Part of the problem is that “interactivity” has typically translated to “computers” for many museum designers, while I think the best answers as to how to get guests involved are far more low-tech. I recently had a discussion with a friend of mine who is working with a museum on an exhibition, and she had proposed setting up a battery of microscopes in order to allow children to look at various specimens first hand. This was shot down as being too risky/expensive because someone would have to be there supervising the children. Another idea of having a visible chick incubator so that children could see the animals being born was rejected as well, and giving children little cups with some seed so they could grow a plant at home was also turned down. As my friend and I agreed, these were the sort of things that drew us into science when we were young, being direct observers to something amazing that cannot be reproduced by computers. Bones don’t even have to be put permanently on display in order to make an impression; the Page Museum, which handles the La Brea Tar Pit fossils, has a lab with a panoramic window that lets visitors see what the researchers are doing. This is a very simple thing, but I think that every major museum should have a similar facility that lets visitors look in on the work being done, and if workers can take some time out to answer questions or give a little talk, all the better. (The Academy of Natural Sciences in Philadelphia has a smaller, but far more cozy open fossil workbench, too). Open labs allow the public an look into what paleontologists really do, and I really feel that it is a shame that more museums do not scientifically open themselves up to the public in a similar way. What is a zoo? Most essentially, it’s an arena of the visual. It’s a place to see wonders. The act of seeing is the primary zoo experience – whereas learning, thinking, and emoting are dimensions of encounter that come secondarily, if at all. We go there to look; in passing, we read a few labels and placards, of which the information content is low. If you sit long enough to “people watch” at a museum (or a zoo), Quammen’s thesis seems all too apt. People go to see dinosaurs and move along without reading much because they already “know” what dinosaurs are; they’ve heard about them in school, seen them “come to life” in movies, bought models and toys, etc. The visit to the museum is a trip to see the animal life size, as close as we’re likely to get, and unless there’s a deeper desire for more knowledge “looking” is as far as it often goes. For now I’ll bypass the idea that dinosaurs are somehow childish and do not merit more comprehensive understanding by “proper” adults, but natural museums should appeal to the inquisitive child in all of us if they are to be effective at all. Such desire for understanding is not always encouraged or rewarded, however, especially in a hustle-and-bustle world of deadlines and field trips. If you watch any group of schoolchildren visit the fourth floor of the museum, you’ll usually see one or two who are inordinately fond of the skeletons on display. They are not allowed to linger to indulge their curiosity, however, as they are told to keep up with the class, bumping into their classmates because they’re continually looking over their shoulders as they leave the museum. Indeed, it seems like curiosity is only allowed as long as it does not interfere with itineraries and the projected lesson plan. This is sad, especially because as the children get older and can move off on their own through the museum (typically in high school) they will probably show less interest in the things that so enthralled them when they were younger. Museum shops can do some damage as well, and I am often surprised at the inaccurate models and toys being sold to children by various establishments. I have a Tyrannosaurus bobble-head on my desk that appears to be plantigrade, with a tail that for some reason is drooping onto the ground, and a head held up like that of a startled chicken. This is not the image of the carnivorous dinosaur depicted in the fossil hall, so why is it fit to pass off to children? Other souvenirs feature dinosaurs from all different time periods lumped together as if Jurassic Park had just let out for the weekend, and while I might seem like a crank in complaining about this, I wonder what sort of message it sends about 1) the role of scientific accuracy in museums, and 2) marketing in museums. Almost any item even bearing the image of a dinosaur is bound to bought by someone, and it often seems like the more dinosaurs there are on a product the better. Given that the most famous ones live in entirely different time periods, the presence of the dino-celebrities is more important than reflecting the ecology of one time period or another. I really do worry about the present state of natural history museums. When I walk the 4th floor of the AMNH, I usually have a general idea of who dug up what and when, being able to spot what has changed since the displays were put up and what is still accurate. Most people don’t have the same background as I do, though, and I can only imagine what they’re getting out of the displays. We all bring out our understanding of nature to natural history museums, our prior knowledge directly influencing our experience. Last February, for instance, I stood in front of an ungulate bone bed section, a jumbled mass of mammal bones preserved under glass. The woman next to me said to her companion “Oh, I’ve heard about this. This is evidence for The Flood, right?” before moving off. She didn’t read the placard, nor did she study the assemblage; all she did was recognize a potential example of something she heard or read at one point or another and moved on. Maybe it’s because I’m a pessimist, but I feel that many visitors to natural history museums do the same thing, merely taking in the familiar but paying little attention to detail. How can we save our natural history museums? Times are pretty tough right now, staff layoffs being common and some museums, like the aforementioned Academy of Natural Sciences, which recently sold off parts of its mineral collections in order to keep the doors open. The famous and nearly-complete Tyrannosaurus “Sue” was purchased by the Field Museum in Chicago for $7.6 million dollars after it went up for auction, but not without help from the California State University system, Walt Disney Parks and Resorts, McDonald’s, Ronald McDonald House Charities, and a few donors, part of the deal being a McDonald’s being placed in the museum (as well as the fossil prep lab being called the “McDonald’s Fossil Preparation Lab”), a cast being made for Walt Disney World’s Animal Kingdom Park, and two more casts going on a traveling tour put on by McDonald’s. Even beyond such deals, corporate logos are starting to sneak into natural history institutions, the big cat exhibit at the Philadelphia Zoo being named the “Bank of America’s Big Cat Falls” with a big Bank of America logo at the entrance, whereas previously corporations were relegated to a name on a list of donors made available to those inquisitive enough to ask for the list. As some have predicted, I have the feeling the corporate sponsorship (even ownership) of natural history museums will become a bigger problem in the coming years, and museums may go from research institutions to huge curiosity cabinets, being more about displays and making money than learning. Such an event occurred just recently in my own state, in fact, the New Jersey Aquarium in Camden changing over into private hands and becoming a for-profit institution under the new moniker of Adventure Aquarium, education being secondary to sensationalism. I sincerely hope that we do not lose our natural history museums. Speaking for myself, I know I probably would not be as interested in evolution and paleontology if it was not for early visits to the AMNH, and I know there have been many much more intelligent and prominent scientists like Stephen Jay Gould who can trace back their own feelings of wonder to the 4th floor fossil halls. Small, home-grown institutions like the Museum of Osteology and the Black Hills Museum of Natural History offer some hope, continuing a tradition put forth by many paleontologists from the turn of the 20th century, but such institutions are usually small and difficult to reach. Even if the larger natural history museums never fully decline and the great dinosaur skeletons remain, we should work hard to promote responsible, accurate, and interesting representations of the history of life on earth, as it is possible for the history of an institution to overtake its intellectual mission of enlightenment, towering masses of bones collecting dust and being petrified in the position of their last revision from ages before. I’m still picking away at fossil horses in the hope that I’ll be able to get something up tonight, but in the meantime check out Matt’s post on Natural History museums (and all the “interactive” doodads that are all the rage in major institutions these days). As is easily apparent from this blog, I absolutely love natural history museums, but there often seems to be as much that annoys me about them as attracts me to them. Never has there been a more frightening visage to grace the hallowed halls of the 4th floor of the American Museum of Natural History than that of Tyrannosaurus rex. I could not help but be awed and terrified by the post mortem articulation of bones of the what seemed to be the apex of dinosaur evolution during my first visit to the great fossil gallery. It didn’t matter that the monster was standing upright, dragging its tail along the ground and dangling its dainty arms feebly in the air, the long-dead dinosaur seemed as alert and ferocious as it must have been in life, as if it was rearing up to its full height in search of small, warm-blooded, 10-year-old Homo sapiens for a snack. Mouth agape, serrated fangs glistening in the sunlight filtering in through the dusty windows, it was hard to turn away from the remains of the last great predator of the Mesozoic, partially out of awe, partially out of an overactive imagination that saw the bones removing themselves from their metal supports to start stomping down the walkway towards scores of hapless visitors. Staring at the magnificently grotesque form I realized that my parents had lied to me; monsters were real, even if the gulf of time kept me safe from their bone-crunching maws.